I’ve lost my heart to a new sock pattern and a new sock yarn. I ran across christhalinette’s take on Beate Zäch’s charming Bluemchen pattern on Ravelry and thought, “How whimsical!” Then I looked more closely. How exactly were those flowers constructed? Wait, are those decreases between the petals? Am I seeing little gussets in unusual places? 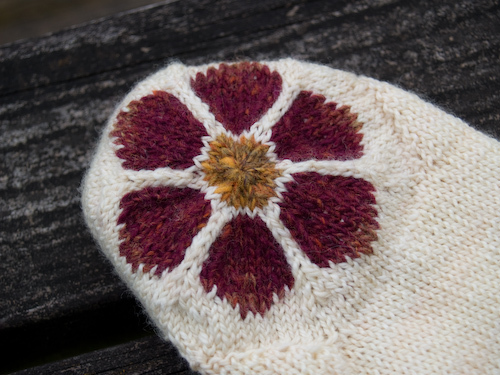 Sure enough, the pattern begins with a little stranded hexagon… and then another coupled to it, and then some funny little earflap pieces… and pretty soon you have something that really does look like part of a sock foot. A sock foot with genius reinforcement in just the places a sock foot needs it. There is a lot more sewing involved than in a regular sock, but I found it so engaging to watch a sock form emerging that I hardly noticed the extra labor. And there it was. The magic glow. And it was coming from something that looked suspiciously like plain, unbleached wool. I quickly restored my face to its normal configuration so I could investigate. The magic was coming from the section of the wall housing the offerings from A Verb for Keeping Warm. No surprise there — Kristine Vejar is a visionary. I love her India-inflected color sense, and also her commitment to natural dyes and to farmers and mills in the U.S. and Canada. But what was this peculiar magic skein of Creating that didn’t look like it had been dyed at all? The color was called “citron.” I carried it over to the window to see it in what was left of the natural light. It still just looked like cream, but the Noro was crazy about it, practically slavering around its skirts. So I shrugged and had them put it on the swift for me. 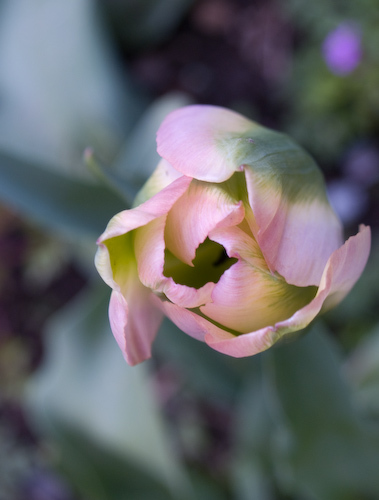 (Just the tulip. Not the invasive wild geranium I need to rip out of every corner in the garden… again.) And not that you can really see it when I take photographs at 6pm after work. You’ll have to take my word for it until I can get proper pictures in proper daylight. The first sock is finished, and so is the first hexagon of the second sock. Can I somehow have both socks blocked by Monday? My birthday girl may have to open a gift containing just one sock, with the second to follow later in the week. Gifting one dry sock would be better than two damp ones, right? Wet socks, even handknit ones with really pretty flowers, don’t exactly say I love you and I’m going to miss you so much when you move to Maine. Wow! Beautiful sock. I’ve gotta admit that I probably wouldn’t dare to try these myself so I like getting to see you knitting them. What a fantastic pattern! I may have to give it a try; my sock knitting has pretty much stalled, and a new technique may help that. 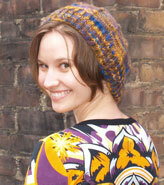 I resisted the lure of Noro for about three years after I took up knitting again. And now I am besotted. I do that Squint Eye, too, but historically just in quilt shops. I may have to add this to my queue on Ravelry; it would certainly entertain my fellow commuters on the train in the morning! Amazing! I have never seen anything like that before. I’m looking forward to seeing the finished socks!! Wow–I’m going to have to try the squint trick. Those colors are amazing together! Those are gorgeous socks. My project for the foreseeable future is to finish the socks I’ve already started (something like 5 pairs), but this will definitely be added to the list as soon as I have finished at least a few of these pairs! Your color choices are lovely! I do the Squint Eye, too, and I use it while painting, drawing, and knitting, so apparently I look like a freak to outsiders whenever I’m doing something I love. The husband assures me I also stick out my tongue when I get focused, so if you ever happen to be in the Bay Area and you see a squinty lady with her tongue hanging out, it’s probably me. oh, my god – how much efford you do to match the colours! 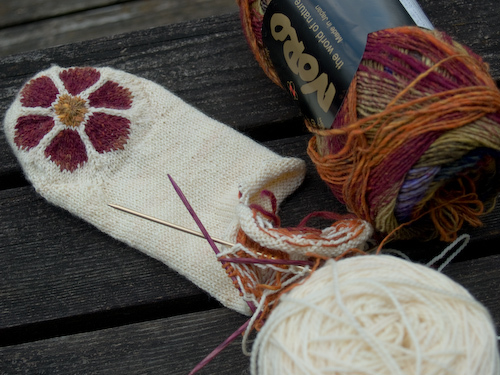 That will give a great result, which can be seen in the half finished sock already. I designed that pattern because I had some leftovers in those flower-colours and made the pattern around these little leftovers – just the opposite way than you do. Ok, I payed more colour-atttention to the second pair, the one where I fixed the fitting of the sock, which wasn’t perfect at first attempt. My ears are really burning how much heart you give to my pattern. I loved to read your blog-post. your color choices are just gorgeous. now I want to make a pair too!